The East Hall (East Hallway in the PAL version) is a room inside the Haunted Towers in Luigi's Mansion: Dark Moon. The East Hall can be accessed taking the north door inside the Hydro Generator. The East Hall is a small room with a cabinet, a vase, and a portrait that can be shined with the Dark-Light Device to drop coins. The door on the north takes Luigi to the Gardener's Dwelling while the door on the right takes him to the Tool Shed. The south door takes Luigi back to the Hydro Generator. 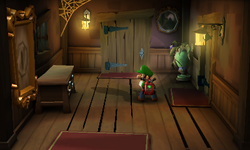 In B-2: The Pinwheel Gate, Luigi needs to go to the East Hall to follow the Hiders that stole the vanes from the pinwheel gate. Luigi meets the Hiders, but they escape before he can catch them. In B-5: Doggone Key, the vase is broken, and spiders drop from the ceiling. There are also Polterpup tracks in this room that lead to the Tool Shed. During B-Bonus: Hostile Intrusion, the East Hall may be one of the rooms infested with ghosts. This page was last edited on September 11, 2018, at 02:15.